Drawing after a photograph in a New Scientist article about the archaeological discovery in Turkey of game tokens from the early Bronze Age, 5,000 years ago. I wonder about whether this marks a significant shift in the production of artefacts away from the utilitarian or ritual manufacture of individual objects towards the production of multiple, identical artefacts for a system of exchange. Here the exchange is abstract and playful, but these tokens seem to predate money (Wikipedia dates commodity money to 3,000 years ago and representative money significantly later)? 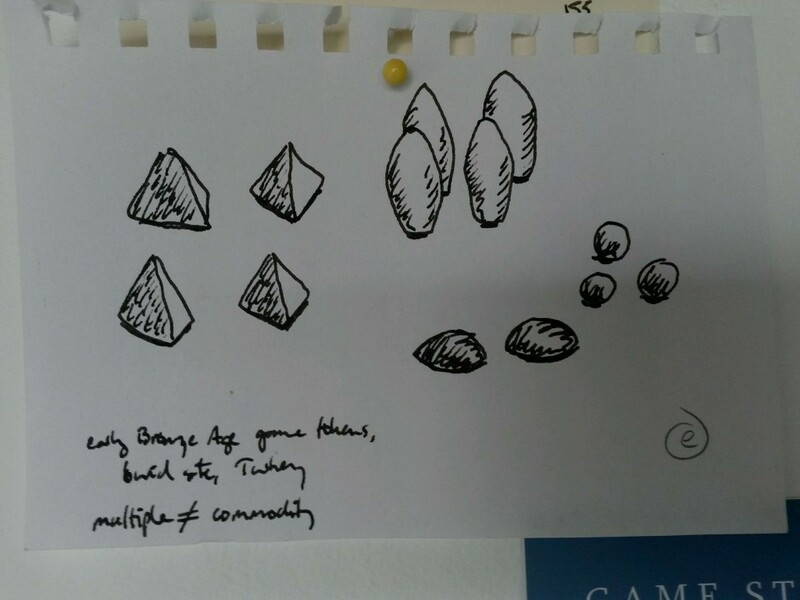 Game pieces as tokens in a ludic pre – economy.